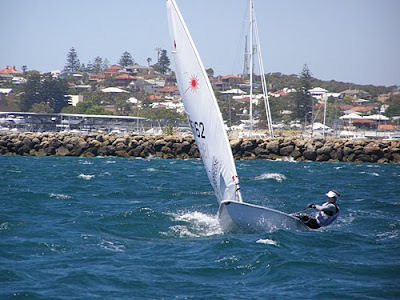 I have just arrived home from my 10-day training trip in Perth, Australia, the site of the 2011 ISAF World Championships. 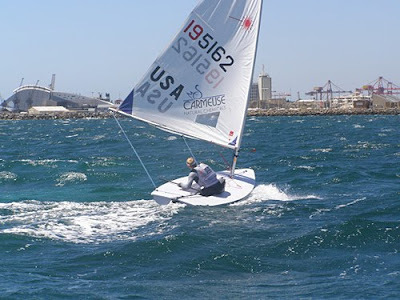 I was sailing the Laser Radial with Marit Bouwmeester from the Netherlands with her coach, Mark Littlejohn. It was a great week of sailing, and we both got a lot from it and learned a lot about the location. So, Perth is a city of about 1.6 million people located as far away from America as is possible. It is on the west coast of Australia, and is a four and a half hour flight from Sydney. I knew it was a good distance across Australia, but I didn't quite realize that it was that wide. It's a great city. Well actually, we weren't in Perth; we were just south of Perth in Fremantle, or Freo as the locals call it. Freo is a smaller suburb of Perth located right on the coastline. We rented a house about 2km from the Fremantle Sailing Club, and our house had bikes with it, so we could ride around everywhere. Now, this area is know for its wind, the Doctor, and believe me, the Doctor never failed to deliver. Of our total of eight days sailing, there was only one instance when we didn't feel the full force of it. We sailed in anything from 14-35kts. It was awesome! Quite a different experience from what I'm used to in training. We had a pretty disciplined daily routine. We would hit the gym in the mornings, sail just as the Doctor was visiting, then come in and most evenings go back to the gym. We had great meals at home, cooked by Mark. It was the deal that we made, he cooked, and we cleaned up the dishes. That worked for us since we had a dishwasher, so it made our job easy. And then most nights, we would venture down into town to have a hot chocolate to wrap up the day. We had a couple of exciting experiences whilst we were there. One happened at around 4:30am. It was about our fourth or fifth day there and it was a weekend. A couple of guys who had obviously been partying, walked by our front gate, and one of them shook it really hard. It woke us up and scared us all for a while until we realized that it was just a couple of kids who had drunk a little too much. The other one was when I got to share my sailing experiences one evening, with the sailors from the Emerging Nations Program. The ENP is a program set up for nations that haven't qualified for the Olympics ever, or for a long time. The sailors receive coaching and training at the site of the Olympic qualifier regatta, so that they will hopefully gain the experience they need to pursue their dreams of competing in the Olympic Games. There were three Radial girls, four Laser boys, and four RSX sailors. They were from countries such as, Pakistan, India, Bermuda, Colombia, Serbia, Moldova, Malaysia, Trinidad and Tobago, Latvia, and Paraguay. On our final day in Australia, we weren't sailing, so we took a trip down the coast to a place called Safety Bay and checked out the windsurfing scene. We hired the instructor for an hour's lesson and had a blast, literally. When we first arrived, the wind wasn't 'windy enough', meaning that despite the fact that it was blowing 15kts, it wasn't the sea breeze so we weren't going out. Our instructor set me up with a 4.0m sail, which is not very big, but given that he told me it was going to pump in at 25kts, I was quite scared to even sail with that pocket handkerchief. But when the breeze came in, and we got out there, it was an amazing way to finish up the week. I learned how to water start, and accomplished half a carve gybe (the first half). I was too scared about hurting myself to really go for it in that breeze; I figured I'd practice when it wasn't quite as windy. That evening, Mark and I went up the river to check out one of the local yacht clubs. It was beautiful, located on a cliff that overlooked the river. We had a great meal and met some of the local sailors, and then I had to get up at 4am the following morning to catch a flight back home. I'm now on my three weeks 'vacation' before starting our match race practices. On January 4th, we have a match racing clinic before our USSTAG Qualifier the following weekend. As a team, despite not sailing, we are still training; we are on a heavy lifting program to gain weight for the end of January, not necessarily a bad goal over the holiday times. For the holidays Brad and I are heading up to Pittsburgh to do a couple of days of skiing, and to see a Pittsburgh Steelers Game!!! The new ISAF Match Racing rankings were released today, and we managed to climb into the top 10, to finish the year at the #10 spot. We're happy with our progress this past year, climbing 28 places in the rankings over the twelve months. We have bigger goals ahead of us and are looking forward to moving up more. I hope everyone has a happy and safe holiday season, and a happy new year. I'll report back after the new year as we launch back into our season of sailing. I would like to thank my sponsor Carmeuse for their continued support of my campaign for the 2012 Olympics in London. I would also like to thank USSTAG for their support. Did you get your copy? 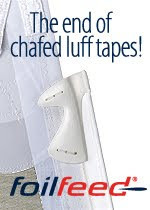 GUYS DON'T READ THIS AD! Why are these to guys smiling? Jaguar Cup Starts this Weekend in Miami! Moth Worlds 2010: Puma To Sponsor!